Hi loves! More Pahlish beauties to share with you today ^^ this time it's the Pahlish The Hidden Door collection. While I was swatching these and editing the pictures, I suddenly realized something about the polish names.. they are all inspired by Florence + The Machine! Well, this makes me a very happy girl, because guess who I am seeing perform December 10th?! That's right, Florence ♥! I made sure to link each polish name to the song on YouTube so if you aren't familiar yet with Florence + The Machine, hit that link to check it out. 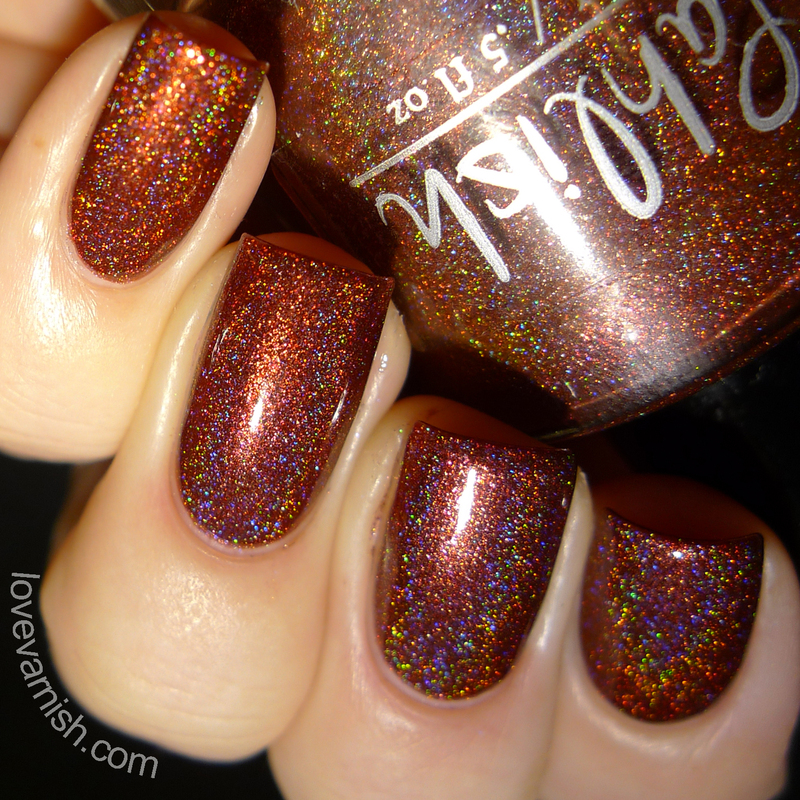 Pahlish Dissolving Like The Setting Sun is a blackened sienna holographic with heavy metallic red shimmer. Woah, what a unique shade! Depending on your lighting and skintone this might look more brown toned or red, and the metallic red shimmer adds a lovely warmth to this shade. I used 2 easy coats and topcoat. Pahlish Ghost in my Lungs is a blackened olive holographic with molten gold shimmer. I can't even with this shade. It's so damn perfect! The gold shimmer gives a nice and bright center while the edges are more dark. Also one of my favorite Florence songs so that helps ;-). The formula is great, 2 easy coats and topcoat for this swatch. Pahlish Lion Hearted Girl is a blackened orchid holographic with heavy metallic pink shimmer. Such a lovely hue of purple! Not too dark, not too light, just perfect ^^. Another great formula, 2 easy coats and topcoat. Pahlish Storms and Saints (sorry, couldn't find a video for this one) is a blackened peacock holographic with bright blue flakes. Yeah, you can probably guess how I feel about this shade, right? It's perfect. Deep, dark, teal, vampy perfection. And, surprise surprise, another perfect 2 coat formula :-D.
From the moment I realized this was Florence + The Machine inspired, the collection became even more perfect to me. The colors are right up my alley and the fact they link to some of my favorite songs make them that much more valuable to me. But, even without the link to the music, these 4 shades are perfect in every way. Shannon has done very well with this set! My favorites are Ghost in my Lungs and Storms and Saints but none of these are EVER leaving my Helmers ever again! How do you feel about this 4-piece set? See anything you like? Tell me in the comments! Pahlish is a US based indie with regular restocks and reasonable international shipping rates. You can find more info in the webshop! The Hidden Door collection has been released already but another restock is happening November 22nd. Make sure to check the Facebook page linked below, as restocks are announced here.